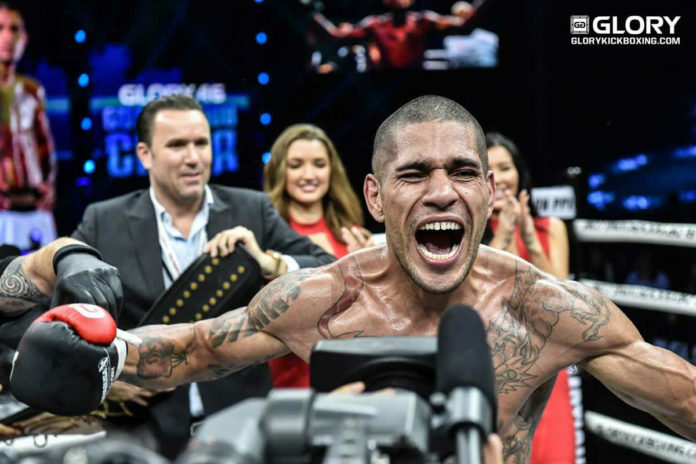 GLORY Kickboxing returns to Netherlands on May 17 with a double championship headliner. The event No. 65 takes place at Central Studios Evenementenlocatie in Utrecht, which is the fourth-largest city in the country. Top of the bill features the defending middleweight champion, Brazilian Alex Pereira (29-6, 17 KO) up against former titleholder, the representative of the city-host Jason Wilnis (31-9-1, 9 KO). The contest is their third outing. Wilnis defeated Pereira twice taking the second-round TKO win in 2012 and a unanimous decision in 2015. Pereira is however won all five previous bouts against Simon Marcus, Yousri Belgaroui and Maycon Silva. This also includes three successful title defenses. Wilnis took the win against Jacob Rodriguez by TKO in February. It was his first victory since April 2017 when faced two split decision defeats against Marcus and suffered TKO defeat (doctor stoppage due to cut) against Belgaroui. Yet, before that he scored a unanimous decision against the rising UFC star Israel Adesanya inside the GLORY Kickboxing ring, as well as defeated the likes of Joe Schilling and Filip Verlinden. #GLORY65 scheduled for May 17 in Utrecht ?? In the co-main event the reigning lightweight champion, Thai Sitthichai Sitsongpeenong (122-30-5, 32 KO) faces Armenian-Belgian Marat Grigorian (60-11-1, 35 KO). The latter makes his third attempt to become a new champion in the division as well as take a revenge. The pair meets for the fifth time since 2015. Their previous encounters ended in favor of the current titleholder. Sitthichai makes his seventh title defense riding the 10-win streak, which includes victories against Josh Jauncey, Tyjani Beztati, Dylan Salvador, among others. Grigorian is coming of a split decision win taken last December against Christian Baya. Other bouts are expected to be announced in the coming weeks.